What is a .bargains Domain? Everyone loves a good bargain. With the .bargains domain, you can engage Internet shoppers and attract attention to your website. This distinct extension is a generic top-level domain, or gTLD, that was first delegated in 2014. While it’s only a few years old, thousands of domains have been registered. It has quickly become a popular option for retailers, bloggers, and marketplace platforms. The word “bargains” is an instant attention-grabber for tech-savvy shoppers around the world. People are constantly looking for ways to save money. As a result, web users often gravitate towards websites that they believe can provide savings on their purchases. The .bargains domain is the perfect solution for any individual or business that operates in the retail industry. 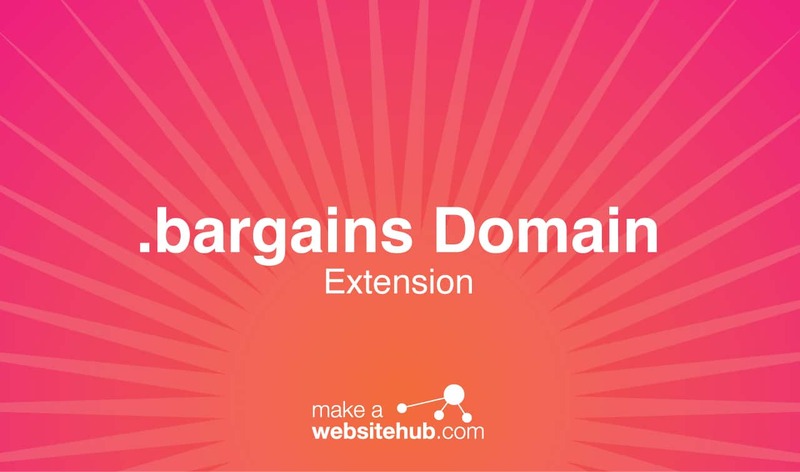 Discount retailers, auction marketplaces, and even advertising agencies can benefit from the .bargains domain extension. The domain instantly connects with shoppers. The purpose of your website is right in the URL. Not only will this attract attention naturally, but it can also improve your website’s search engine optimization. The keyword is something that many online shoppers are looking for, so the domain can help get your website higher up on search engine results. If you sell products directly through your e-commerce website, the extra attention you get from the .bargains domain can make a huge difference in your bottom line. It can help you facilitate sales, resulting in increased traffic and company growth. There are no use restrictions for the .bargains domain. As a result, it’s open to anyone, not just stores and retailers. While online shops can certainly use the domain to their advantage, it’s also become a popular choice among advertisers and bloggers. Advertisers love it because it can be a powerful tool to promote sales and products. If people are looking for a specific item on the Internet, there is a higher chance that they are going to click on a link with the .bargains extension over a traditional .com or .net option. This is because the extension lets them know that your website is a place that can help them save some cash. Bloggers who are dedicated to telling their audience about the latest deals and promotions can also utilize the domain to attract attention. The .bargains domain is unique and incredibly memorable. You can easily create a web address that stands out through domain hacking. For example, a blog could use an address like DesignerFashion.Bargains. This URL tells readers that you can guide them in the right direction during their shopping endeavors. It’s efficient marketing and clever branding all in one fun domain extension. Where Can You Buy a .bargains Domain Extension? Numerous registrars offer the .bargains domain. As mentioned earlier, it’s a generic domain with no major restrictions. Anyone can use it, regardless of the specific industry they’re in or the type of content they want to host. Take a look at the following domain name registrars to see if your domain name is available.